When you’re stationed in a far-away country, the dating landscape definitely changes. Hikes to scenic vistas, ski trips… and an adventure in the Korean Demilitarized Zone? 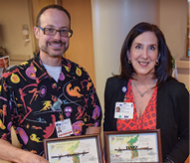 It was all part of the whirlwind courtship between pediatrician Chad Tarter, M.D., and Stephanie Bredar, R.N., in 2005, photo at left, when both captains were stationed at Osan Air Base in South Korea. Dr. Tarter was the only pediatrician on base, while Stephanie’s role as a nurse had her taking care of active duty airmen. And yes, one of their more memorable dates was a visit to the DMZ. Fast forward to 2018, and the couple, now married, both work at NorthBay Healthcare: Dr. Tarter at NorthBay Medical Center in Women and Children’s Services, and Stephanie as director of Ambulatory Quality. They hold a note of gratitude, far left, from the government, complete with barbed wire from the DMZ.